The woman who inspired so many great works of art as a professional model was born in Steyning as Sarah Cox, a blacksmith's daughter. It is a cliché in the history of art, that the artist falls in love with his model. Her beauty inspires him to paint her again and again. Before long, inevitably, he finds another woman who obsesses his imagination. The lives of these women, whose faces are more familiar to us than the artists themselves, are told as simple tales of beauty soon diminished by age and a return to the poverty from which they came. This has often been assumed to be the story of Dante Gabriel Rossetti and Fanny Cornforth. She was a golden-haired beauty who became one of the unforgettable faces of Pre-Raphaelite art. A closer look at her life reveals something unexpected. She was never entirely abandoned by the man who painted her and their love, though much changed, lasted to the end of his life. Rossetti was a founder and leader of a new artistic movement, several of whose associates supported their working class models when they gave up paid work, tutored them and even encouraged their artistic abilities. Some did not consider themselves above marriage to one of the women who had so enriched their art. Fanny Cornforth's lasting relationship with Rossetti is actually less remarkable than the inappropriate snobbery of those who took charge of his legacy and their deliberate efforts to misrepresent her. Since Kirsty Stonell Walker published her autobiography, Stunner: The Fall and Rise of Fanny Cornforth, many errors and assumptions about her story have been exposed. Fanny Cornforth's maiden name was Sarah Cox, the name which appears in the records of her birth at Steyning on 3rd January, 1835. Her baptism by the Reverend Penfold at Steyning church, was on 1st February. Sarah's father, William Cox came from a family of blacksmiths. He didn't inherit his father's forge and scraped a living as a hired man. He married Jane Woolgar, from the nearby village of Bramber, on 21st July, 1834. The family lived at a house on the corner of Tanyard Lane and the High Street when Sarah was born. It is currently a shop named The Doll's House, marked with a blue plaque. William Cox's family suffered a series of tragedies, which were sadly common in Steyning at the time. Three children died in infancy. Then in February 1847, Sarah's youngest sister, Fanny died and two months later her mother died as well. Kirsty Stonell Walker believes the family was stricken by tuberculosis. William Cox took his daughters, Sarah and Ann, to Brighton. He found work in a newly developing industry, the railway, married Harriet Maybank and had another child, named Mary. Little Mary soon died. When William Cox's own health declined, Harriet began a new life and he returned to Steyning. William was buried in the church yard in 1859 with his first wife and their lost infants. Sarah Cox probably had no choice but to find work as soon as she was old enough. By the 1851 Census, she was in service at a respectable Brighton lodging house in Western Road, working for Mr and Mrs James Worger as their only servant, with ten others living in the house. Her life by the age of only sixteen had already been hard, with little realistic hope of anything better. The lodging house closed in 1854. Her father's illness took her back to Steyning, along with her sister, Ann who was nine years younger than Sarah. In later years, Sarah simply said she lived in Steyning at this time. It is tempting to imagine her at the family forge, where Ann is later recorded living with her grandmother, nursing her father and somehow providing for them all. Sarah was twenty one on the day of an enormous celebration in the Surrey Pleasure Gardens, at Walworth in London. The troops and their nurses had returned from the Crimean war and Sarah was there to experience the excitement of it all with her aunt, who was visiting St John's Wood. It was 25th August, 1856. Also in the crowd as the evening fireworks lit up the sky were Edward Burne-Jones, Ford Madox Brown, Cormell Price and Dante Gabriel Rossetti. Pre-Raphaelite artists were ever on the lookout for exceptional women who might be persuaded to model for them. When he spotted Sarah, Rossetti drew close as she and her aunt were "having supper in one of the arbors." Sarah remembered that he flicked her hair as though it was a passing accident. When the calf length golden mane tumbled down her back, the artist was smitten. Despite the aunt's scolding, Rossetti charmed them both. 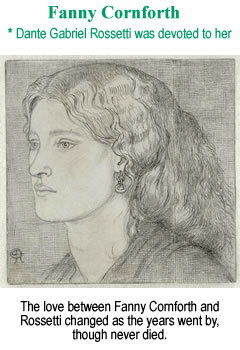 Next day, Sarah was accompanied by her aunt to the studio where Rossetti sketched her for the first time. Sarah was soon modelling in London for Rossetti, Burne-Jones, George Price Boyce and J. R. Spencer Stanhope. 24 Dean Street in Soho was the first address of her modelling career, followed by 14 Tenison Street in Waterloo, Lambeth. She met a part-time artists' model, Timothy Hughes, her future husband, who was a mechanical engineer with a stepfather named George Cornforth. This is clearly the origin of Sarah's assumed name. A remembrance of her lost sister may explain the name Fanny. 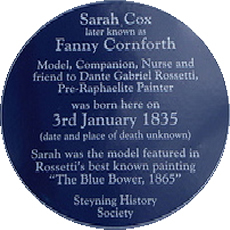 Although Sarah Cox changed her name at about the time she met Rossetti, it is not really known why. It has been alleged that she intended to deceive Rossetti and his friends about her true origins. Yet many of Rossetti's later transactions show 'Sarah' Hughes or Schott, her married names. It seems that when Sarah began work as an artists' model, she was simply concerned to mind her reputation - which some in Rossetti's world would have found laughable, and yet we take 'stage names' for granted. Fanny Cornforth was undeniably a working class girl. There were people in Rossetti's family and social circle who condemned her for it. Working class women were, of course, intent on seducing gentlemen for their money. Fanny suffered many such insults. That she was illiterate has been proved untrue, for instance, since many of her letters still survive. As her career as a celebrated model began, the artist George Price Boyce declared that he had fallen in love with Fanny. His attention to her was short-lived, since she had already developed an attachment to Rossetti. He painted Fanny for Boyce in 1859 and produced Bocca baciata, meaning 'the kissed mouth', described by the poet Swinburne as, ‘"more stunning than can be decently expressed." In a letter to George Boyce, Rossetti sketched the composition of Bocca baciata with an account of his progress in painting it, providing also an insight into how Steyning people spoke at the time: "Above is the composition of Fanny's portrait, which you will see has taken after all a rather Venetian aspect. 'Them be'ind's merrygoes,' as the fair original might say in her striking rendering of the word marygolds." Dropping or adding an 'h' in all the wrong places is how Fanny's speech was recorded by several people who, often for less friendly reasons, wanted to convey an idea of her social class. Rossetti's art was transformed by his sensuous appreciation of Fanny Cornforth. It seemed like an all-consuming passion - but not for long. And yet there was something between them that endured, as the story of her life with Dante Gabriel Rossetti, in the next article, reveals. A fundraising drive was launched to commission a fitting memorial to Fanny Cornforth and all that she achieved in her life. See details of this GoFundMe crowdfunding campaign. and many others of interest. 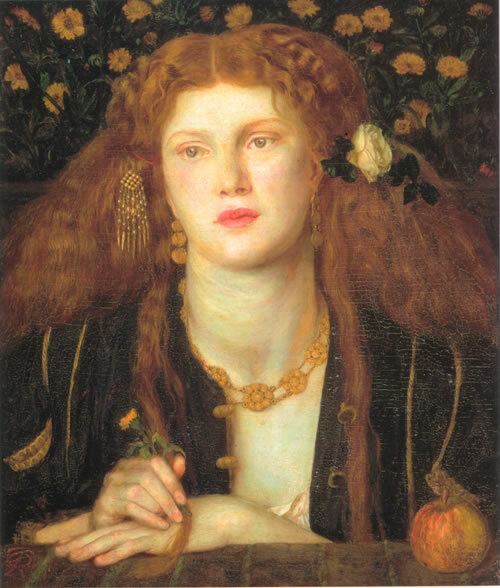 A blog for Pre-Raphaelite lovers and researchers by Stephanie Graham Piña, with an emphasis on the women of the movement, including Fanny Cornforth. The project is about the history of the Graylingwell Hospital and the people associated with it from 1894 onwards, now including Fanny Cornforth. Rossetti's muse. See also here. An entry for Fanny Cornforth by Christopher Whittick.